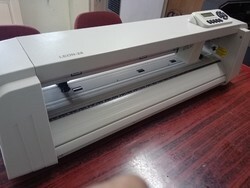 Silhouette Cameo 3 Desktop Cutter, Capacity: 12"
Offering hassle free installation, these Vinyl Cutter Machine are durable and remain sustained for longer years. In addition to this, offered cutting machines are quality approved by professionals before presenting in market. Available in market in many sizes and specifications, these machines do not require maintenance for longer time.